Microsoft Windows 8, Server 2012: Should I Drink The Kool-Aid? 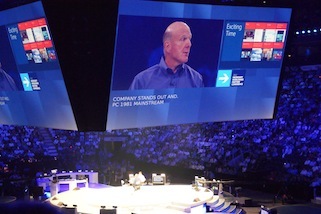 Surrounded by 16,000 Microsoft partners last week, I began to believe CEO Steve Ballmer: Microsoft's product pipeline (Windows 8 for tablets and PCs, Office 2013, Windows Server 2012 with Hyper-V, Office 365 Open, and more) is the strongest in the software giant's history. Surrounded by 16,000 Microsoft partners last week, I began to believe CEO Steve Ballmer: Microsoft’s product pipeline (Windows 8 for tablets and PCs, Office 2013, Windows Server 2012 with Hyper-V, Office 365 Open, and more) is the strongest in the software giant’s history. I gotta admit: In some ways I’m starting to drink the Microsoft Kool-Aid again. But I’m not swallowing everything Microsoft (NASDAQ: MSFT) has to say. Back in 1995, I was sold on Windows 95, Office 95 and the forthcoming Windows NT Sever 4.0 strategy — backed by SQL Server, Exchange Server and more. Those products delivered huge upside for partners and defined much of the client-server age. Fast forward to 2012, and I really, truly believe Microsoft Windows Server 2012 and Hyper-V are set to take market share from VMware, based on my discussions with some Microsoft partners. (Why else would VMware be shaking up the company with an apparent CEO change this week?) I also believe Office 365 cloud deployments will accelerate — regardless of whether partners jump on the bandwagon. Windows 8: I’ve got lingering doubts, especially since many customers are just now getting used to Windows 7. A gradual shift from Windows XP and Vista (let’s not pretend it doesn’t exist) to Windows 7 should continue for years to come. How will Windows 8 compete with Windows 7 in the PC market and Apple iPad in the tablet market? That remains to be seen. Office 365 Open: This new approach, which allows partners to manage end-customer cloud billing, will take a year for Microsoft to fully roll out on a global basis. I have 10 Office 365 Open Questions that MSPs should be asking. And I find it ironic that Google Apps was ahead of the game with the cloud billing capability for partners. Office 2013: Microsoft wants Office to transform into a cloud service. An example: Office 2013 documents will be stored, by default, in Microsoft’s SkyDrive cloud service. But I have a confession: I haven’t purchased an Office upgrade in about five years. I’m fine with the current Office release blended with Google Apps. Overall, I think Microsoft’s partner story is far stronger right now than it was in 2010 and 2011. But if I was running an MSP, I’d choose my spots really wisely. Microsoft finally has major software and cloud services in nearly every major IT market. But that doesn’t mean all of those products will be winners. What other options do IT support firms have? Apple really doesn’t have the penetration into the market to be a real threat even though I use one, I still run Microsoft Office software and live on Outlook, even on my Mac. So what other options do we have? Microsoft is the largest strategic partner all MSPs have, like or not…our clients use their products every day.